Perhaps the most striking aspect about the GSMDs is their size and beautiful three-colour coat. But, before you bring home a GSMD, think do you have enough time to bring him up, do you have enough place for dog weighing 60 kg and as high as 72 cm, and this shepherd dog be with his herd (family). You should not isolate these dogs from the family as they need to be near human all the time. GSMDs have a strong and proportional body. Their skull is flat and broad with a slight stop. The backskull and muzzle are approximately equal in length. The muzzle is large, blunt and straight, and most often has a slight rise before the end. His eyes are almond shaped and may vary in colour from hazel to chestnut, medium-sized, and neither deep set nor protruding. His medium-sized ears are set high, triangular in shape, gently rounded at the tip and hang close to the head when relaxed. When alert, the ears are brought forward and raised at the base. His tail is thicker at the base, tapering to a point as it reaches the hocks and is carried down in repose. But, when alert and in movement, the tail may be carried higher and curved slightly upward; it should not curl over the back. Their topcoat is black, with markings in rich rust and white. Their average height is 60-72 cm and weight is around 59-61 kg. They are intelligent and familiar. Since they are shepherd dogs, they are close to their guide and territory. They have amazing quality to converge with good people and they can be used in dog therapy. They love to be near humans, they learn easily, but not always get through commands. It happens that they are independent and timorous. They like children but you should not leave them alone with children. Sometimes GSMD doesn’t realize his size and can unintentionally hurt. They give everyone the incentive to play biting nipping, which is a shepherd dog’s quality. It isn’t aggressive, but it is good when you teach your dog that it is undesirable behaviour. GSMDs have moderate temperament; they are caring and sociable. They do well in low temperatures. They are friendly to other animals but may sometimes be bolshie and disobedient. They need to be trained, right from puppyhood to be obedient. GSMDs are very intelligent and positive training brings effects quickly. They are really gourmands; they love to eat. So, it is the responsibility of the pet parent to feed him a well-balanced diet in the right quantity. During the time of growing, till the age of 18 months, their joints should not be overstrained with strong move or weight. Let the puppy move as much as he wants. Puppy grows very fast till the 5th month and gets heavier, even two kg weekly. They need to be fed with high-protein diet, containing Glucosamine and Chondroitin to make their joints stronger. During the next two years, the dog still grows, not as fast as earlier but systematically and gains muscles till the 4th year. Feed them a high quality, balanced diet, specific to their age and breed. Puppy shouldn’t be made to walk long distances and up and down the stairs. They have short coat with undercoat and don’t need special treatment. Brushing during moulting twice a year (spring and autumn) is enough. Use a furminator for brushing undercoat. 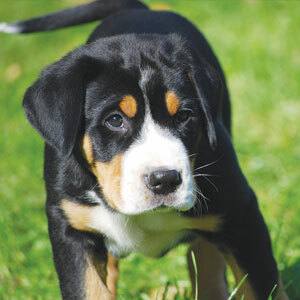 Adult Great Swiss Mountain Dogs can be trained for agility; you can even give him truck to pull and jog. But they shouldn’t run next to a bicycle as they aren’t sprinters. They like pulling cloth or cord, pursuits, etc. However, they don’t like swimming and retrieving. GSMD suffers from eyes genetic diseases, epilepsy and just like other giant breed dogs they have problems with dysplasia hip joints, elbow joints and shoulder joints. In all, a GSMD is an ideal family pet who thrives on love and attention…in fact a small price for the unconditional love and companionship they provide! http://www.dogsandpupsmagazine.com/wp-content/uploads/2011/07/breed011.jpg 134 250 Dogs and pups Magazine http://www.dogsandpupsmagazine.com/wp-content/uploads/2017/05/1254nal.jpg Dogs and pups Magazine2011-07-20 05:24:492014-02-07 17:40:32Greater Swiss Mountain Dog loving all the way!